The Chicago Community Trust (CCT) is celebrating its 100th anniversary this year with an ambitious vision—to reimagine philanthropy and make Chicagoland the most philanthropic region in the nation. IMAN is joining the celebration by participating in On the Table 2015, CCT’s yearlong campaign to celebrate everyday philanthropists. IMAN’s On the Table conversation will be held over refreshments on May 12th between 4:30pm and 6:30pm at our Youth and Arts Wellness Center at 2747 W. 63rd Street. 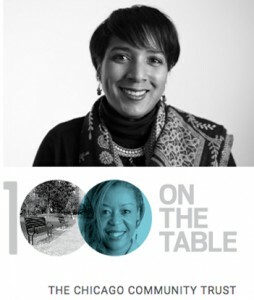 The overarching theme of all On The Table conversations will b e stories of philanthropy, and how Chicagoans have given of their time, talent and treasure over the years to help our dynamic city and its many neighborhoods live up to the highest principles and values of all our sacred traditions. IMAN will be focusing on that legacy through a conversation on a very special MLK Memorial Project. This memorial, which will be built locally at the IMAN Youth and Arts Wellness Center and unveiled in Marquette Park on August 5, 2016, commemorates the 50th anniversary of Dr. King’s march through the park in 1966, and the legacy of community action and struggle that has thrived here ever since. It will celebrate the continued work towards realizing a vision of a dignified quality of life underlying King’s quest for a Beloved Community. The initiative will also be the launch pad for a local artisan workshop that will be a hub for artists — as well as aspiring youth and adult leaders — to hone their creative abilities, learn a new craft, and sell their artwork. This workshop would be housed in IMAN’s new Youth and Arts Wellness Center, established through the construction of the memorial to provide a vital space for community development, social entrepreneurship, and leadership development. Your voice is a critical part of that larger conversation, and we would be more than honored if you could join us on Tuesday, May 12th. Please let us know if we can count on your presence at IMAN’s On the Table event by RSVPing here today. This entry was posted in News, One Chicago by IMAN Staff. Bookmark the permalink.